Going through my archives of recipes, photographs and thoughts every single month gives me a chance to pause and take note of what I managed to capture and what I didn't. It helps put things into perspective for me. I like to outline on paper ahead of time the subjects I want to cover for a particular month, all the while taking notes, adding things or removing them. It's how I blog. The items I don't get to cover always get pushed back for a later date & I make sure not to forget what it is I wanted to say, capture or express; everything gets jotted down. The subject of Good Things is boundless in my opinion, which is why I initially thought of using those words for my blog title. The month was certainly filled with my favorite things, but it seemed to have been overtaken by The Good Egg. I started with the idea of eggs, Araucana eggs to be exact, because I love using them in my kitchen for baking & cooking. I first had to pay a visit to one of my favorite markets in the country, The Reading Terminal, in order to get some of these eggs. Knowing that I was going to be shopping there, I decided to give you all a tour of this magnificent space in Center City Philadelphia. The eggs, of course, reminded me of the famous paint palette based on the hues of these beauties, picked by Martha Stewart for the former Martha by Mail catalog. With the eggs I then decided to show you the best way to hard boil them perfectly in your kitchen. That superb egg salad meant for sandwiches seemed to be a hit with some of you, so I thank you for trying it! Let's not forget the brownies for The Monthly Cookie made with delicious chocolate chips. Chewy, chocolaty & fudgy are just some of the ways to describe those wonderful bar cookies. You really should make a batch of them in the near future. A glorious vanilla cake iced with some delicious, simple vanilla frosting was baked at the end of the month. I showed you step by step how to accomplish the easy task of putting together those scrumptious layers for any given day of the year. Perfect for that special celebration, it's also wonderful to bake just because you feel like it. To round out the month I made some healthy quinoa while showing you my preferred way of eating it at home. Many of you are already acquainted with this seed and others have promised me they intend to make some soon. Let's go back through the month of August here on the blog, because there were some good ideas, good recipes and lots of good eggs! This wonderful photograph was sent to me by a friend & reader of the blog. Darlene is a great baker who manages to make the best things for her family in New York, so when she saw my posting for these delectable brownies she got to work. In no time, a batch was baked and immediately consumed by her loved ones. 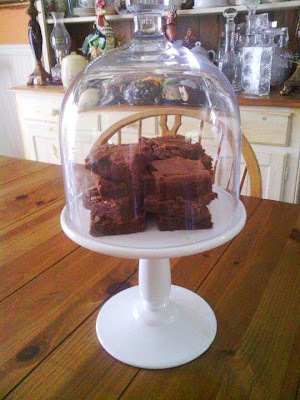 I particularly like the Martha Stewart Collection cake stand with glass dome here. It has an antique ironstone look to it, don't you think? Thank You Darlene for the support and I'm glad you're having success with the recipes! The bar cookies slide right out quite easily if you use a long piece of parchment paper or foil to line the pan. With a sharp knife, the whole brownie can be cut into 4x4 portions. Stacked on one of my antique glass cake stands, the bar cookies seem to beckon you to grab one. After biting into one of these brownies, you're going to come back for another one. I can almost guarantee it. Make some this weekend! I adore these plates from Martha by Mail. They are exquisitely executed in pure white porcelain with delicate gilding. For the longest time I had these in storage and never used them. Perfect for that dessert at the end of a formal meal, they're equally suitable for a first course or for hors d'oeuvres at a cocktail party. If you own a set, do use them. Never ever put these plates in the dishwasher; hand washing only! I wrote extensively about this market which I've been coming to for years. I love it because there is a little of everything for everyone. Kauffman's (above) is among my top 5 spots in the market. I love the produce, the honeys and the many canned goods sold here. Everything is made in small batches with the utmost care. Pay them a visit. Fair Food Farmstand is another of my favorites here at The Terminal. I wish we had more food cooperatives like this one, because I feel it's an important way to live by and it's a great way to try the best of the best in local produce. I will continue to shop here for years & years to come. A porcelain egg dish in the shape of a hen holds a few dozen Araucana eggs. I love using them, I love eating them and I enjoy seeing them in my kitchen. Although they are pricier than supermarket eggs, they are absolutely stunning. For Martha Stewart, it was these eggs from her chickens at Turkey Hill that spawned the color palette: The Araucana Colors. These were the swatches from Martha by Mail that many of you remember. The colors were used extensively by Martha at her former Westport, Connecticut home. Her namesake magazine also featured them throughout its pages over the years. What's not to like about these gorgeous eggs and these breathtaking colors? Make them yours. The perfect hard boiled egg is never hard boiled. It's cooked gently off the heat after the water has come to a hard simmer. Never again will you have overcooked eggs with gray-colored egg yolk casings. I always plunge the eggs into iced water after the allotted cooking time has passed. It cools them down in minutes. A fresh egg will never peel easily. Egg whites will stick to the shells quite stubbornly, so it's always advisable to use eggs that are several days to a week old for hard boiling. Save the ultra fresh ones for frying, poaching, frittatas or for ethereal omelettes. A perfectly peeled hard boiled egg. Cooked to perfection is what you want from a hard boiled egg. I love having them just like this with some coarse kosher salt and a bit of freshly cracked pepper. As I said in this posting, I'm very picky about my egg salads. The flavor has to be good, but so does the texture. If you follow my instructions, a tasty salad can be made in minutes, provided you have some ready-to-peel hard boiled eggs. They should be cold before you begin. I made this egg salad a few days ago and enjoyed open-faced egg salad sandwiches with some thinly sliced pickles on top. Delicious! Many of us who bake pies swear by rolling pastry on marble. Caring for it is easy as long as you keep certain things in mind. Warm water and clean dish towels will keep your marble looking its best. Since marble is porous, one should never soak it with water. It will absorb it up like a sponge if it isn't sealed properly. Any type of china is susceptible to breakage with such a hard surface. If I'm going to stack plates on it, I make sure to place a few cotton towels down before I do so to prevent any mishaps. A sweet frosting made in minutes is just the thing to have under your belt if you bake a lot. The icing can be frosted onto cakes, cupcakes or even sandwiched between cookies. I don't worry about refrigerating this icing after I've used it on a dessert since it doesn't contain any eggs. Do you see how easily it spreads onto a cake? It glides on smoothly and is easy to work with. I find it best to make it the moment I need some for best flavor & texture. A frosted cake is just begging to be devoured. A vanilla cake shouldn't be difficult to make. I take you step by step in the preparation of this superb batter, from start to finish. With only a handful of ingredients, tall layers can be baked for just about any occasion. You're going to be tempted to taste the batter at some point during the mixing. If you do, don't tell anyone! Golden layers that are cooling are going to permeate your kitchen with a sweet aroma. These are beautiful cakes. Serve me a slice of this birthday cake and I will be in heaven! With a tender crumb, the cake layers slice like a dream. The taste is familiar, homey and pure vanilla through & through. Can you see how nice the cake is? If you haven't noticed yet, the wedge is sitting on one of my Antique Star Dessert plates. The fork is American silver and the cake stand is sandwich glass from the early 1900s. Make this cake soon. I know you're going to love it. Perhaps the next time I make this cake I'll end up using some delicious jam between the layers or I may even frost it in chocolate buttercream. Quinoa is so good for you. It's a complete protein that tastes extraordinary. I always buy it in small quantities because I don't want it to go stale in my pantry. Usually I will make it the straightforward way, by having the seeds simmer in broth until cooked, but I have been known to make it into a pilaf. I can see this being used as a stuffing for bell peppers. A healthy dinner that's easy to make and tasty to eat. Include some fresh herbs finely chopped for an appealing taste. I love doing this rather than reaching for some salt whenever I want to add flavor to a dish. It's a good habit to get into. I hope you're all enjoying the final days of August! Quinoa is one of those ancient seeds that many of us are beginning to discover and incorporate into our weekly diets at home. Available as a creamy white or dark red seed, quinoa is high in fiber & protein and has nine essential amino acids. Aside from the nutritional virtues found in quinoa, a flavorful serving can be cooked in less than 20 minutes making it possible to compose a good meal in less than 30 minutes. Quinoa is something I like to make on a regular basis since it pairs well with just about any vegetable, but it's also wonderful to have with some flavorful tofu or some eggs cooked any which way; for vegans and vegetarians, the seed is a great way to include that necessary protein in one's diet. You can, of course, serve it with some wonderfully poached fish, sauteed chicken cutlets or even a few Frenched lamb chops for heartier fare. I prefer to eat quinoa with legumes because I get the added benefits of more fiber & more protein. It is a perfect meal in one plate when you have this combination. Rather than cooking it in plain water, I always use a flavorful homemade or low-sodium store bought broth (either chicken or vegetable) to simmer the seeds until they're tender. The one thing you must do before cooking quinoa, however, is to rinse it thoroughly in cold water to remove any residue of saponins. Familiarize yourself with the basic way to cook quinoa and my preferred ratio of liquid to seed before you begin. It's a great alternative to rice or even pasta. Let's make some now. Quinoa is small and round, resembling millet and even couscous many of us are familiar with. The most commonly available type of quinoa varies in color from white to light beige (above), but it's also available in a dark red color. Either one is quite nutritious. I keep mine stored in an old apothecary jar tucked in my pantry. Note: if your stock already contains salt, don't add it. Note: most packages recommend cooking 1 cup of quinoa with 2 cups of liquid, but I find this to be too mushy for my tastes. For a more toothsome & chewy texture, I prefer using a 1:1.5 ratio. Using a fine mesh sieve (this is a tiny seed! ), rinse it under cold water until the water runs clear. I always use a spoon to move the quinoa around as I'm rinsing to remove any traces of residue. Place the seeds and the stock (or water) in a pot; over high heat bring it up to a hard simmer (not a true boil). As soon as it does, cover the pot with a lid and lower the heat to low. Set your timer for 16 minutes. After 16 minutes, the liquid should be evaporated and fully absorbed by the quinoa. If there is any trace of moisture on the bottom, continue to cook for another minute or two. When done, let the quinoa sit for 5 minutes. Every germ from the seed will open up and curl like a tiny tail when fully cooked. The cooked quinoa is light and delicious when done. Taste for salt and add a bit of pepper if you wish. Tender, chewy & wonderfully good. This tasty dinner contains a helping of my Basic Black Beans, some steamed organic corn (either frozen or fresh off the cob) and a generous serving of quinoa. I topped it with a quick avocado salsa ( 1/2 an avocado chopped & 1 whole plum tomato, seeded & chopped; squeeze 1/2 a lime, salt & pepper to taste, toss & serve--enough for 2 helpings). Don't forget to sprinkle everything with some chopped flat leaf parsley or cilantro. Delicious! Treat yourself and your family to quinoa the next time you find yourself in a rut and don't feel like making rice or pasta as a side for dinner or lunch. I'm glad that most major supermarkets are beginning to carry boxes or bags of quinoa which can be found in the same aisle as the rice & legumes. Keep your eyes out for them the next time you're at the market and buy a small amount to try at home. Although it resembles couscous in texture, the flavor is something entirely different. Earthy & quite tasty, you're going to love how quickly it cooks and how good it is for you. If you find yourself liking quinoa as much as I do, buy it in small quantities from a store with a high turnover rate and store it in a cool, dark part of your pantry. A flavorful thing to cook, a nutritious thing to consume, quinoa is a good thing to stock at home. Savor every spoonful!